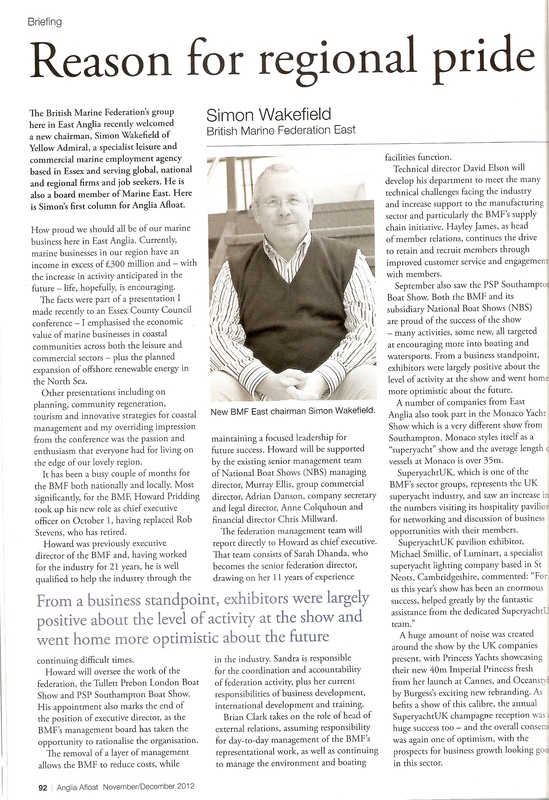 Yellow Admiral MD Simon Wakefield recently wrote a column in Anglia Afloat about the bright future for the marine industry both locally and internationally. 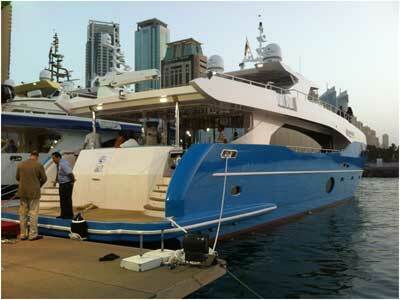 Simon Wakefield, Managing Director of Yellow Admiral, attended the Dubai International Boat Show again this year. Some see the success of the show as a sign that Dubai’s economy is recovering but Simon warned that significant growth was unlikely to return in the medium term and the marine sector was still challenging for service providers. For the last two years Yellow Admiral, the specialist marine employment agency based on the Essex coast, has sponsored the Guinness Bar at Seawork. This has coincided with, and hopefully been partially responsible for, a dramatic change in Yellow Admiral’s performance within the industry. Initially the company was built up around providing staff to the leisure marine sector, but with the global financial crisis this side of the business temporarily went into decline, particularly in Europe. Despite this slump in the design, development and build of leisure craft and superyachts the commercial side of Yellow Admiral’s practice, in particular the offshore renewables business, has expanded dramatically and continues to do so today. Yellow Admiral now works with clients who are involved in the full project life cycle of the offshore renewable energy sector and they have had a very successful 12 months. This year they have increased the number of vacancies that they are helping their clients fill by 250% and the number of quality people they have placed is very encouraging. With demand predicted to increase for staff with skills in marine, mechanical and electrical engineering, marine geophysics, offshore construction and marine support expertise, they are confident that Yellow Admiral will continue to expand its operations. Paul Miall, who manages the commercial side of Yellow Admiral’s business, commented that “the real challenge this coming year is to help address the serious skills shortages in the renewables sector. With our wide ranging contacts across other engineering sectors we are confident that we can help existing and new clients achieve their staffing objectives. Our participation in Seawork is key to this as it is now established as THE meeting place for everyone involved in the commercial and renewables sectors”. BMF Commercial member Yellow Admiral is a specialist leisure and commercial marine employment agency based on the Essex coast. Initially the business was built up around providing staff to the leisure marine sector, but with the global financial crisis this side of the business temporarily went into decline particularly in Europe. However while the design, development and build of leisure craft and even superyachts has slowed the commercial side of Yellow Admiral’s practice, in particular the offshore renewables business, has expanded dramatically and continues to do so today. Yellow Admiral now works with clients who are involved in the full project life cycle of the offshore renewable energy sector. Indeed Yellow Admiral has had a very successful 12 months. This year they have increased the number of vacancies that they are helping their clients fill by 250% and the number of quality people they have placed is very encouraging. With demand predicted to increase for staff with skills in marine, mechanical and electrical engineering, marine geophysics, offshore construction and marine support expertise, etc. they are confident that Yellow Admiral will continue to expand its operations. The real challenge this coming year is to help address the serious skills shortages in the renewables sector; but with contacts and the experience gained in over 20 years working with the marine and automotive industries, Yellow Admiral is sure that they have a great opportunity to help existing and new clients achieve their staffing objectives. Superyachts and the leisure marine sector have proved the core business for specialist employment agency Yellow Admiral. But as the global financial crisis took a temporary toll, the company was delighted to see its commercial side take off with offshore renewables business expanding dramatically. "While the glamour of working on super yacht assignments is very attractive to our recruiters, the excitement of being part of a new and rapidly expanding sector is extremely satisfying as well", said Paul Miall who manages the commercial side of Yellow Admiral's business. The company now works with clients who are involved in the full project cycle of the offshore renewable energy sector, including commercial vessel and workboat designers, developers and manufacturers; shipyard and port operators and managers, maritime security agencies, maritime security agencies, commercial divers, dredging companies, hydrographic surveyors and towage and salvage firms. With demand predicted to increase for staff with skills in marine, mechanical and electrical engineering, marine geophysics, offshore construction and marine support expertise, Paul is confident that Yellow Admiral will also continue to expand its operations. The business was built around providing staff to the leisure marine sector but the world economy has meant that side temporarily declining with the design, development and build of super yachts slowing. So the uplift in the renewables business proved a tremendous bonus - although creating a real challenge in itself as there are serious skills shortages in these categories of staff. Paul believes the experience that Yellow Admiral has in other areas of engineering related recruitment will enable the company to recruit in non-traditional areas while his personal interest in all things marine mean that traditional sources of staff are not ignored.